Uncrewed spaceflights to the International Space Station (ISS) are made primarily to deliver cargo, however several Russian modules have also docked to the outpost following uncrewed launches. 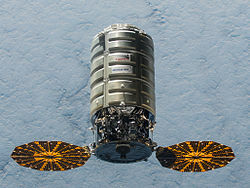 Resupply missions typically use the Russian Progress spacecraft, European Automated Transfer Vehicles, Japanese Kounotori vehicles, and the American Dragon and Cygnus spacecraft. The primary docking system for Progress spacecraft is the automated Kurs system, with the manual TORU system as a backup. ATVs also use Kurs, however they are not equipped with TORU. Progress and ATV can remain docked for up to six months. The other spacecraft — the Japanese HTV, the SpaceX Dragon and the Orbital Sciences Cygnus — rendezvous with the station before being grappled using Canadarm2 and berthed at the nadir port of the Harmony or Unity module for one to two months. As of April 2019, Progress spacecraft have flown most of the uncrewed missions to the ISS. Baikonur Cosmodrome in Kazakhstan is the oldest and busiest spaceport. The first module of the ISS was launched from Baikonur Cosmodrome Site 81 as the uncrewed spacecraft Zarya in 1998 and flew uncrewed for about two years before the first crew arrived. The Progress spacecraft is the most frequent cargo ship sent from Baikonur to the station, bringing supplies such as food, fuel, gas, experiments and parts. Its light payload is offset by its ability to deliver critical replacement parts at short notice. Fresh fruit and vegetables from earth are an important part of the crew's diet. Located in Japan on an island 115 kilometres (71 mi) south of Kyūshū, the Tanegashima Space Center (TCS) is the launch site for H-II Transfer Vehicle (HTV), called Kounotori (こうのとり, Oriental Stork or White Stork), used to resupply the Kibō Japanese Experiment Module (JEM) and the ISS. The name Kounotori was chosen for the HTV by JAXA because "a white stork carries an image of conveying an important thing (a baby, happiness, and other joyful things), therefore, it precisely expresses the HTV's mission to transport essential materials to the ISS". White Kounotori can carry 6,000 kilograms (13,000 lb) of cargo in total, about 3,500–4,500 kilograms (7,700–9,900 lb) of which is accessible by the crew in the pressurized section, the remainder is unpressurised cargo on Exposed Pallet to be handled by the ISS's robotic arm. The European Space Agency (ESA) uses the Guiana Space Centre or, more commonly, Centre Spatial Guyanais (CSG). It is a French spaceport near Kourou in French Guiana. Operational since 1968, it is particularly suitable as a location for a spaceport due to its proximity to the equator, and that launches are in a favorable direction over water. The near-equatorial launch location provides an advantage for launches to low-inclination (or geostationary) Earth orbits compared to launches from spaceports at higher latitude, the eastward boost provided by the Earth's rotation is about 463 metres per second (1,520 ft/s) (1,035 miles per hour) at this spaceport. The ESA's Automated Transfer Vehicle weighs 20.7 tonnes (20,700 kg) at launch and has a cargo capacity of 8 tonnes (8,000 kg) (1,500 to 5,500 kilograms (3,300 to 12,100 lb) of dry cargo, up to 1,000 kilograms (2,200 lb) of water, nitrogen, oxygen, air), with up to two gases per flight, and up to 4,700 kilograms (10,400 lb) of propellant for the re-boost and refueling the station. Cape Canaveral Air Force Station, located in Florida, USA, has been operational since 1950; with its first orbital launch occurring in 1958. All of NASA's crewed Mercury and Gemini missions were launched from the Cape, along with some of the earlier Apollo missions. Cape Canaveral is adjacent to the Kennedy Space Center, where the majority of Apollo missions and all the Space Shuttle missions were launched from. Under contract with NASA, SpaceX launches the Dragon spacecraft to resupply the American portion of the ISS. The Dragon can transport 6,000 kilograms (13,000 lb) of pressurized and unpressurized cargo and can return 3,000 kilograms (6,600 lb) to Earth. It is the only uncrewed resupply vehicle capable of returning a payload. The Mid-Atlantic Regional Spaceport, located at Wallops Island, Virginia, USA, is the launch site for the Northrop Grumman Cygnus spacecraft for resupplying the American portion of the ISS. This is a list of uncrewed spaceflights to the International Space Station. Assembly flights are indicated in bold text. Note: Russia has delivered cargo via the uncrewed missions of Progress since the launch of the ISS, while the U.S. had used space shuttles for hybrid human/cargo missions, resulting in greater number of Russian uncrewed flights to the ISS. Since the discontinuation of the space shuttle program in 2011, the numbers of crewed and uncrewed flights by the U.S. and Russia are more closely matched. ^ For vehicles that are berthed to the station using the Space Station Remote Manipulator System (SSRMS) the times of berthing and unberthing are given. These vehicles remain physically attached to the station longer than indicated when counting the time between initial SSRMS capture and release. Currently, the Japanese HTV, the SpaceX Dragon and the Orbital Sciences Cygnus are the visiting vehicles to attach in this manner. For all other vehicles the times of docking and undocking are given. Scheduled future flights are shown below. ^ "ESA — ATV — Crew role in mission control". Esa.int. 2011-03-02. Retrieved 2011-05-23. ^ "ESA — Human Spaceflight and Exploration — International Space Station — Automated Transfer Vehicle (ATV)". Esa.int. 2009-01-16. Retrieved 2011-05-23. ^ ""KOUNOTORI" Chosen as Nickname of the H-II Transfer Vehicle (HTV)". JAXA. 11 November 2010. Retrieved 11 November 2010. ^ "HTV Overview". JAXA. Retrieved 4 December 2016. ^ Anikeev, Alexander. "Cargo spacecraft "Progress M1-4"". Manned Astronautics - Figures & Facts. Archived from the original on 2007-10-09. Retrieved 2012-04-22. ^ NASA (2007). "ISS On-Orbit Status 12/23/07". National Aeronautics and Space Administration. Archived from the original on 2 Jun 2008. Retrieved 23 December 2007. ^ NASA (2007). "ISS On-Orbit Status 12/26/07". National Aeronautics and Space Administration. Archived from the original on 2 Jun 2008. Retrieved 28 December 2007. ^ NASA (2008). "ISS On-Orbit Status 02/04/08". National Aeronautics and Space Administration. Archived from the original on 2 Jun 2008. Retrieved 6 Feb 2008. ^ NASA (2008). "ISS On-Orbit Status 02/05/08". National Aeronautics and Space Administration. Archived from the original on 2 Jun 2008. Retrieved 7 Feb 2008. ^ "Fresh Cargo Ship Arrives at Space Station". space.com. ^ NASA (2008). "ISS On-Orbit Status 04/07/08". National Aeronautics and Space Administration. Archived from the original on 2 Jun 2008. Retrieved 8 Apr 2008. ^ "ISS On-Orbit Status 04/22/10". National Aeronautics and Space Administration. ^ "ISS On-Orbit Status 11/12/09". National Aeronautics and Space Administration. ^ "ISS On-Orbit Status 12/08/09". National Aeronautics and Space Administration. ^ "ISS On-Orbit Status 02/03/10". National Aeronautics and Space Administration. ^ "ISS On-Orbit Status 02/05/10". National Aeronautics and Space Administration. ^ "ISS On-Orbit Status 05/10/10". National Aeronautics and Space Administration. ^ "ISS On-Orbit Status 04/28/10". National Aeronautics and Space Administration. ^ "ISS On-Orbit Status 05/01/10". National Aeronautics and Space Administration. ^ "ISS On-Orbit Status 10/25/10". National Aeronautics and Space Administration. ^ "ISS On-Orbit Status 06/30/10". National Aeronautics and Space Administration. ^ "ISS On-Orbit Status 07/04/10". National Aeronautics and Space Administration. ^ "ISS On-Orbit Status 08/31/10". National Aeronautics and Space Administration. ^ "ISS On-Orbit Status 09/10/10". National Aeronautics and Space Administration. ^ "ISS On-Orbit Status 09/12/10". National Aeronautics and Space Administration. ^ "ISS On-Orbit Status 02/20/11". National Aeronautics and Space Administration. ^ "ISS On-Orbit Status 10/27/10". National Aeronautics and Space Administration. ^ "ISS On-Orbit Status 10/30/10". National Aeronautics and Space Administration. ^ "ISS On-Orbit Status 01/24/11". National Aeronautics and Space Administration. ^ "ISS On-Orbit Status 01/22/11". National Aeronautics and Space Administration. ^ "ISS On-Orbit Status 01/27/11". National Aeronautics and Space Administration. ^ "Crew Attaches Japanese Resupply Vehicle to Station". National Aeronautics and Space Administration. ^ "ISS On-Orbit Status 03/28/11". National Aeronautics and Space Administration. ^ "ISS On-Orbit Status 01/28/11". National Aeronautics and Space Administration. ^ "ISS On-Orbit Status 01/30/11". National Aeronautics and Space Administration. ^ "ISS On-Orbit Status 04/22/11". National Aeronautics and Space Administration. ^ "ISS On-Orbit Status 02/17/11". National Aeronautics and Space Administration. ^ "ISS On-Orbit Status 02/24/11". National Aeronautics and Space Administration. ^ "ISS On-Orbit Status 06/20/11". National Aeronautics and Space Administration. ^ "ISS On-Orbit Status 04/27/11". National Aeronautics and Space Administration. ^ "ISS On-Orbit Status 04/29/11". National Aeronautics and Space Administration. ^ "ISS On-Orbit Status 10/29/11". National Aeronautics and Space Administration. ^ "ISS On-Orbit Status 06/21/11". National Aeronautics and Space Administration. ^ "ISS On-Orbit Status 06/23/11". National Aeronautics and Space Administration. ^ "ISS On-Orbit Status 08/23/11". National Aeronautics and Space Administration. Retrieved 29 Aug 2011. ^ "ISS On-Orbit Status 08/24/11". National Aeronautics and Space Administration. ^ Harding, Pete (24 Aug 2011). "Russia's Progress M-12M launches toward ISS – fails to achieve orbit". NASASpaceFlight.com. Retrieved 24 Aug 2011. ^ "ISS On-Orbit Status 10/30/11". National Aeronautics and Space Administration. ^ "ISS On-Orbit Status 11/02/11". National Aeronautics and Space Administration. ^ "ISS On-Orbit Status 01/24/12". National Aeronautics and Space Administration. ^ "ISS On-Orbit Status 01/26/12". National Aeronautics and Space Administration. ^ "ISS On-Orbit Status 01/28/12". National Aeronautics and Space Administration. ^ "ISS On-Orbit Status 04/19/12". National Aeronautics and Space Administration. ^ "ISS On-Orbit Status 03/23/12". National Aeronautics and Space Administration. ^ "ISS On-Orbit Status 03/29/12". National Aeronautics and Space Administration. ^ "ISS On-Orbit Status 09/29/12". National Aeronautics and Space Administration. ^ "ISS On-Orbit Status 04/20/12". National Aeronautics and Space Administration. ^ "ISS On-Orbit Status 04/22/12". National Aeronautics and Space Administration. ^ "ISS On-Orbit Status 07/23/12". National Aeronautics and Space Administration. ^ "ISS On-Orbit Status 07/29/12". National Aeronautics and Space Administration. ^ "ISS On-Orbit Status 07/31/12". National Aeronautics and Space Administration. ^ "ISS On-Orbit Status 05/22/12". National Aeronautics and Space Administration. ^ "ISS On-Orbit Status 05/25/12". National Aeronautics and Space Administration. ^ "ISS On-Orbit Status 05/31/12". National Aeronautics and Space Administration. ^ "ISS On-Orbit Status 07/21/12". National Aeronautics and Space Administration. ^ "ISS On-Orbit Status 07/27/12". National Aeronautics and Space Administration. ^ "ISS On-Orbit Status 09/12/12". National Aeronautics and Space Administration. ^ "Expedition 32 Mission Status Center". Spaceflight Now. ^ "SpaceX's Private Dragon Supply Ship Departs Space Station". Space.com. Retrieved 2012-05-31. ^ "ISS On-Orbit Status 10/10/12". National Aeronautics and Space Administration. ^ "ISS On-Orbit Status 10/28/12". National Aeronautics and Space Administration. ^ "Russian Cargo Craft Departs". National Aeronautics and Space Administration. ^ "Dragon Docking With Station Set for Sunday". NASA. 2 Mar 2013. Retrieved 2 Mar 2013. ^ "Europe's Heaviest Cargo Ship Launched to Space Station". European Space Agency. ^ "Russian Cargo Craft Launches on Expedited Trip to Station". NASA. ^ "Japan’s HTV-4 successfully berths with the ISS", Aug 9, 2013. Retrieved Aug 9, 2013. ^ "Station Releases a White Stork and Awaits a Swan". NASA. ^ https://arstechnica.com/science/2017/10/nasa-tries-an-inflatable-room-on-the-space-station-likes-it/ . Retrieved 27 Nov 2017. ^ "Dragon Berthed at Harmony Node 2 Module Earth Facing Port". NASA. 23 Feb 2017. ^ Clark, Stephen (October 31, 2018). "Launch schedule". SpaceFlight Now. Retrieved November 1, 2018. ^ Clark, Stephen. "Boeing confirms delay of first Starliner crew capsule test flight to August – Spaceflight Now". Retrieved 2019-04-03.